The Walnut Street Inn, previously known as the McCann-Jewell House, is a wonderful example of Queen Ann Victorian architecture. Steeped in history, this home has had a succession of historically significant owners, starting with Charles McCann. In 1879, Springfield was 50 years old and ready for real growth. Young men were still going west to seek their fortunes, and Charles McCann was one of them. From Indiana, with his wife and two children, he came to Springfield. Immediately he became involved in business and civic affairs, and throughout his life had a hand in the development of the city. Wholesale trade was one of the most important features of Springfield in 1879. McCann decided to form a wholesale grocery firm, the Springfield Grocery Company. In 1886 he helped organize and served as a director and president of the Springfield Club, later to become the Chamber of Commerce. He then bought shares in the Springfield Wagon Company. It became one of the four largest wagon manufacturers in the nation. Mr. McCann was instrumental in the securing of the Frisco railroad shop's location in Springfield. He was the major force in raising funds to build Springfield's first public library in 1905. The Main Library still stands at 397 East Central Street. The Springfield Grocery Company today serves the restaurant trade of an 180-mile radius into Kansas, Oklahoma, Arkansas, and Missouri, and is a large employer in the Springfield area. The Chamber of Commerce has around two thousand member businesses. Mr. McCann's first wife died not long after he came to Springfield, and in 1891 he married Miss Katherine Ashworth. Charles wrote in his journal, "While I had not made any resolutions, it had always appeared to me as a matter of course that I would not marry again...but I became acquainted with Miss Ashworth, and as I grew to know her better, my interest and affection were aroused to an extent that I was impelled to ask her to make a home for me, and when she had consented to marry me, I had the sensation of beginning life anew." Charles built this house during the panic times of the mid-1890s. Jobs were hard to find, and skilled craftsmen were eager for work. Wrote Charles, "Good carpenters were paid only two dollars a day... I bought lumber, the best, in carloads, for ten dollars per thousand feet delivered, and other items in the same proportion, yet this house cost me nearly $6000... I put in the latest improvements except for electricity (and this exception was quite a mistake). I had Henry Hornsby cast for me 20 iron corinthian columns, which gave the house a very handsome appearance, and when finished, it was one of the best looking homes in the street." The McCanns loved to entertain, and the entire downstairs was open for parties. There is a carriage entrance on the west side of the house, with a sidewalk and steps that lead down to what is now John Q. Hammons Parkway. Picture a carriage pulling up to deliver ladies for an afternoon visit with Katherine McCann. The ladies alight, and the carriage driver wheels around to the Carriage House to unhitch the horses, cool his heels and perhaps share some gossip with other drivers until they are called for the trip home. Until it was fully renovated into four large guestrooms in 1992, the Carriage House came complete with horse stalls and the carriage master's quarters. An owner between the McCanns and the Jewels was recently unearthed while reading the autobiography of Charles McCann. According to Charles: "In February 1904, W.A. Dennis came to me one night at the Springfield Club and asked, 'Charlie, do you want to sell your house at 704 E. Walnut Street (now 900 E. Walnut)?' I said, 'Yes.' 'What will you take for it?' he enquired. I replied, '$8,500,' and he said at once, 'I will take it.' We arranged the details; I agreeing to give him possession on May 1st, as I had planned to move to the farm near Mountain Grove that date, he to pay cash. It was the quickest sale I ever made, and I regret to say that Dennis never took possession, as he died about one month after we made the deal and the property went to his wife who improved it and lived in it for some time." Being lovers of antiquity and sleuthing, we are eager to discover more about Mr. and Mrs. W.A. Dennis. We know he must have been a businessman to be a member of the Springfield Club. His ability to pay $8,500 cash for the house suggests he was probably wealthy. Maybe the best clue is that he died somewhere between February 4 and May 1, 1904. We'll keep you posted! Mr. & Mrs. Harry S. Jewell, owner of the Springfield Leader Newspaper, purchased the house in 1917. Aside from his newspaper business, he was president of Springfield Paper and Supply Company. Jewell also built and owned the Jefferson Theatre in Springfield, a popular vaudeville house and the original home of the Grand Ole Opry. On Mrs. Jewell's death in 1940, the house was divided into an upper apartment for Mr. Jewell, with the addition of a kitchen and a stairway which was his private entrance (now the Overnight Guest Entrance). The downstairs became an apartment for Mr. Jewell's granddaughter; her husband, Arch A. Watson; a son, Arch Warren Watson, nine months old; and later, a son, Sanford Duvall Watson, who was born while they were still living here. An east/west wall was put in, dividing the large reception room (our Parlor), and the openings into the study (now the Carver Room) were sealed. The third floor continued to be the servant's bedroom (now the Wilder Room) and the attic (now the Benton Room). Mr. Jewell continued to live in the house until he died in 1945. Arch A. Watson was later president and publisher of the Springfield New Leader and Press. Arch Warren (Tige) and Sanford Duvall (Sandy) still live in Springfield as does Jean J.D. Watson. She winters in Palm Beach, Florida now. The next owners, Dr. Max and Barbara Rosen, bought the house in 1953 and raised their five children here. In 1953 the original three-story balconies on the south were removed and a deck was added. (The Browns replaced the balconies in 1988 when the house was converted into the Inn.) The Rosens traveled extensively, and their interests of children, reading and travel were richly reflected in the house. Three of the Rosen children still live in Springfield. 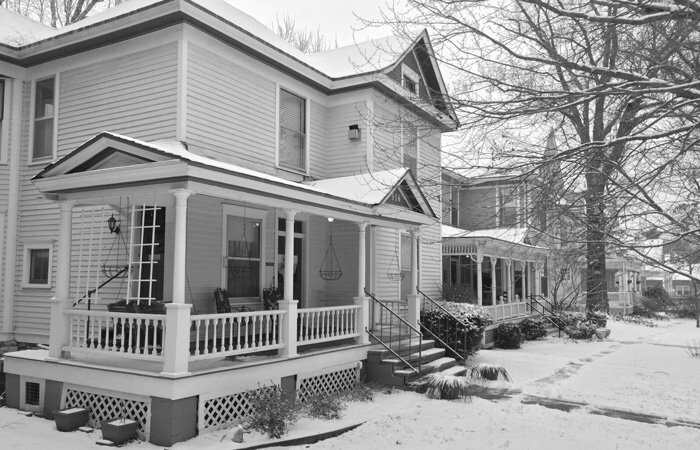 In 1987, Gary and Nancy Brown purchased the home to create the first bed and breakfast inn in Springfield. After a year of rehab and construction, the house was featured as the 1988 Springfield Symphony's Designers' Showcase Home. 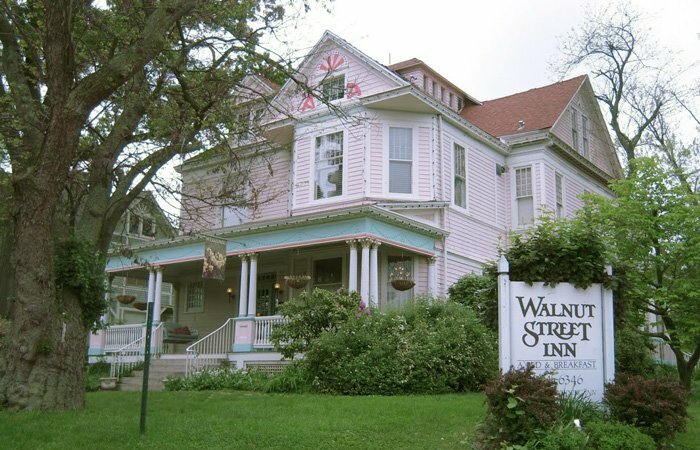 Walnut Street Inn opened to guests in May 1988. 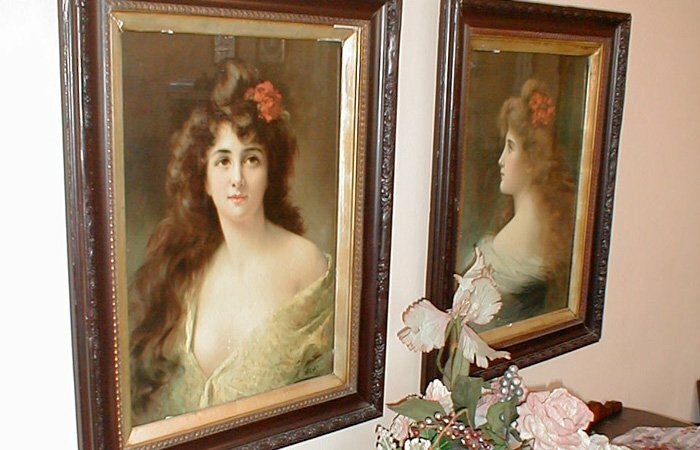 Karol, the Brown's daughter and only 19 when the Inn opened, managed the Inn for the nine years that the Browns owned it. Together, through hard work, creativity and marketing savvy, the Brown's created an inn that Country Inns Magazine chose as "One of the Top 12 Inns in the Country." 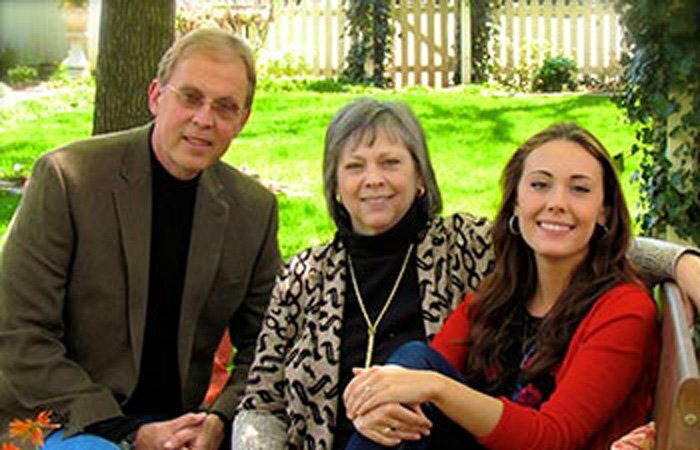 Gary, Paula and Catherine Blankenship purchased Walnut Street Inn from the Browns in July 1996. Originally from the Springfield area, Gary and Paula left in 1981. They spent the next 15 years living in five major cities around the country. Gary traveled over 100 nights a year on business--good experience for a future innkeeper, but a lonely life for both him and Paula. Too many relocations, too many nights away from home, and their daughter Catherine reaching school age made them reevaluate their priorities. They decided it was time to come home to the Ozarks. They wanted a family business, and owning a bed and breakfast had been a dream for many years. 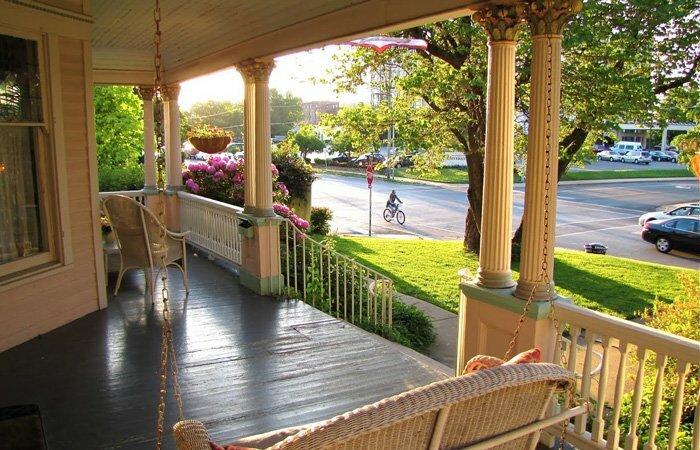 Considering that Missouri State University and an urban business district have grown up around it, the house and property have been remarkably well preserved. All of the oak floors and leaded glass windows are original. 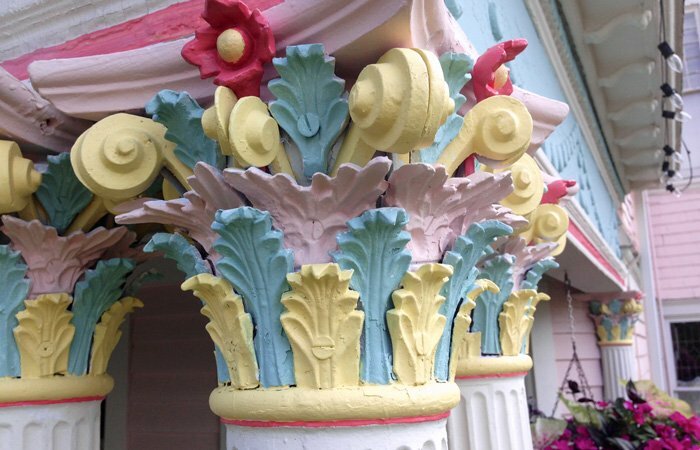 The Corinthian columns are more beautiful than ever after having been meticulously hand-painted. Four original light fixtures remain in the foyer, dining room, gift shop and Carver Room. The Rosen Room contains one of the bathrooms added in 1910, with its original porcelain fixtures, small porcelain tiles and built-in cabinets. The Dining Room contains some of the earliest examples of craftsman treatment in the Ozarks. When built, the house had six fireplaces, and after a fire destroyed the attic, four of the six fireplaces were removed. Original fireplaces remain in the Carver Room and the Second Floor Parlor. The wall that once divided the downstairs was removed and the first floor is again wide open for entertaining. Recently, a bride and groom arrived in a horse-drawn carriage for their wedding reception on the Walnut Street Inn lawn and used the Carriage Entrance for their grand entrance--just as they would have done in Victorian times. Shadows of the past are visible in the yard as well. The lawn is shaded by towering mature trees: walnut, sycamore, redbud and a rare German Linden tree, whose seed may have been purchased from one of the many drummers who traveled the roads after the Civil War. Originally, on the southeast corner of the lawn, there was a fountain that trickled into two goldfish ponds. Today, in the springtime, you can see two large rings of daffodils that once encircled the ponds. In fact, flowers serendipitously spring up all over the lawn. The house at 900 East Walnut has been a "dream" home for a few, lucky families. You can feel their happy memories as soon as you walk through the door. The Blankenships are delighted to share this grand old home with their guests. Treat yourself to a stay at Walnut Street Inn and create your own happy memories that will become part of its history.